I’m going to start this review by referencing Piko-Taro... and you thought that his 15 seconds of fame was over and everyone was sane again. See, what is so great, and so hilarious about PPNP is the fundamental absurdity of mashing two completely unrelated things together. Fruit and pens. Pineapple and Apple and pens. Apple pen! Given that the song is about nothing else but mashing fruit and pens together, you’ve got a completely absurd song that calls back to the grand old days of Dada, where people made nonsense poems that the’d recite in no particular language, just because it sounded amusing. Related reading: Another really great ACE Team game on PS4 is Abyss Odyssey. Matt's review. So let’s mash Monkey Ball and tower defence together with historical recitals. What could possibly go wrong? 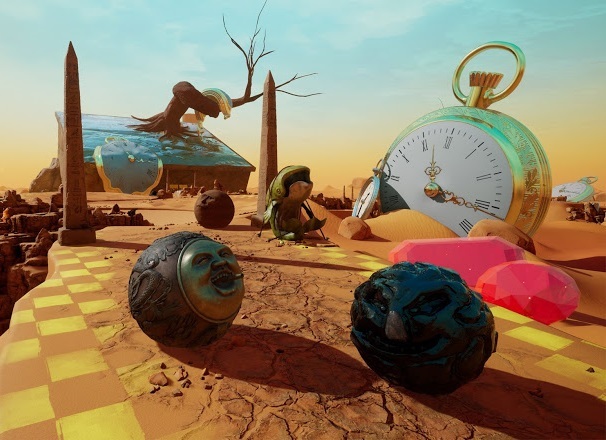 I am, of course talking about the utterly absurd Rock of Ages 2, which comes to us from ACE Team, a Chilean development studio that, having also developed the Zeno Clash games and Deadly Tower of Monsters, has never been a stranger to surrealism bordering on pure Dadaism. 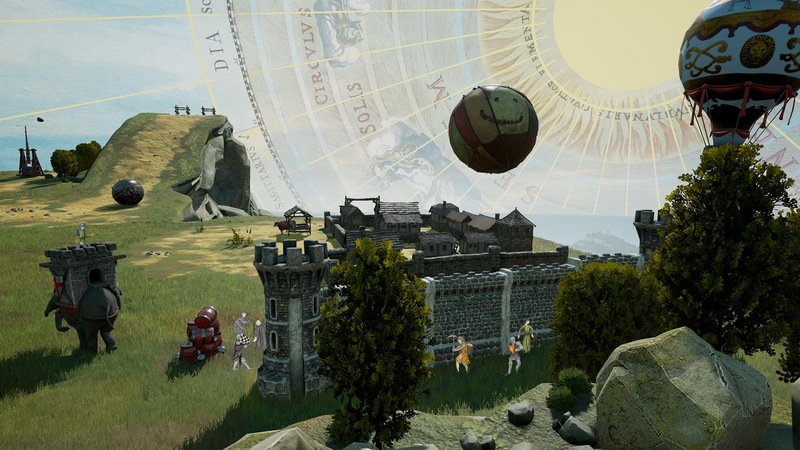 It’s one of the most distinctive and unique development studios out there, and Rock of Ages 2, building on the foundations that were laid down by its predecessor, just might be the talented studio’s best work to date. Clearly inspired by Monty Python, a comedy troupe from a few decades ago that is surely known to everyone reading this (and a team that themselves were not opposed to the odd Dadaist moment), Rock Of Ages 2 takes various moments of history and mythology and pits you, in the role of the Greek giant that held the world on his shoulders, Atlas, against all these figures from history. Why? To be honest I can’t even be bothered trying to explain it. It’s all too weird to make sense outside of the context of playing the game anyway. What you do need to know is that the game is genuinely funny. In one scene you’re taking on Scottish rebel, William Wallace (yes, the one Mel Gibson played), and what the script managed to do with the dialogue from Braveheart had me laughing more than I should have. The combination of nonsense humour, the overwrought to the point of silliness art style and spot-on comedic pacing of it all simply “clicked” with me. 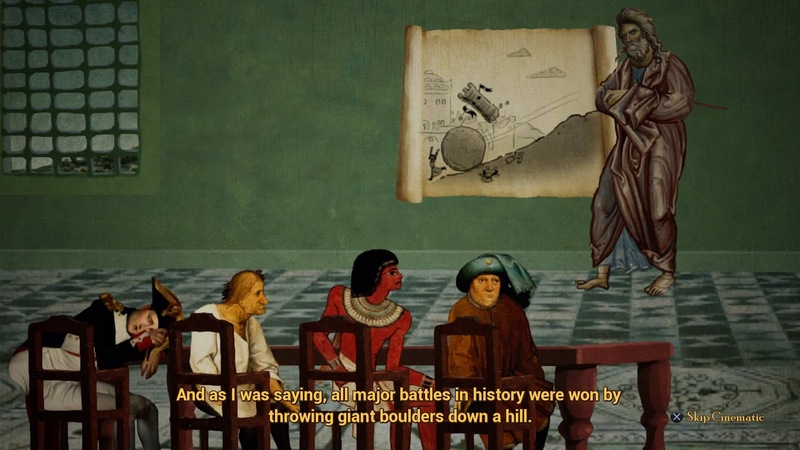 I have to wonder if the reliance on Monty Python-era aesthetics and movies that are older than most “gamers” are means that many of Rock of Ages 2’s punchlines will be lost, but as an old guy, I “got” it all, and it all was glorious. The nonsense doesn’t let up once you start playing the game itself. As I wrote earlier, it’s Monkey Ball crossed with tower defence. 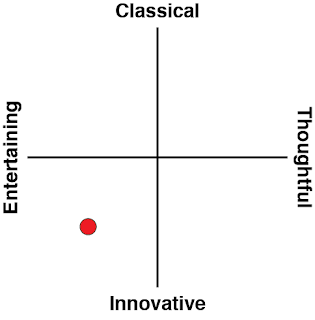 The game is split into two distinct sections. The first section tasks you with rolling a boulder down a mountain, winding around obstacles and so on, in a bid to have it crash into the enemy’s castle as quickly and undamaged as possible. The more damage a boulder has taken, the less damage it will do to the castle. The other half of the game happens between boulder rolls, where you’ll construct obstacles and weapons to try and damage or slow down the opponent’s boulder. That’s the tower defence element, and there is a lot of that to work through. Placing traps to flick the enemy’s ball out of the play area (thus damaging it), building walls to slow it down as it crashes into them, catapults to damage the ball directly, or sticking cows around the map that will, somehow, “stick” to the boulder, causing it to roll more slowly and just some of the many crazy things that you’ll be defending your castle with in Rock of Ages 2. The first side to batter down the enemy’s castle door and splatter their leader is the winner. 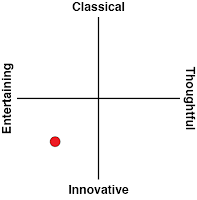 Generally a level will feature a number of these phases. 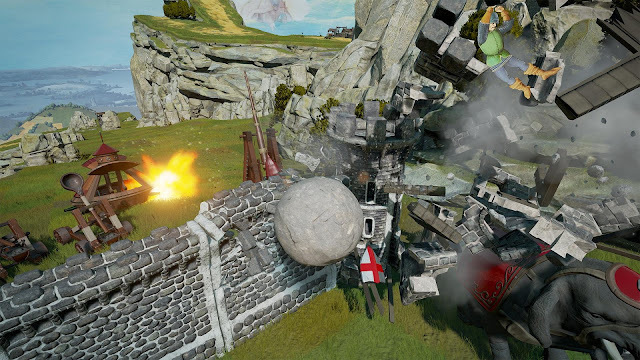 A player won’t batter down the enemy’s gate with a single boulder roll, but that attack will give them money to build up some more defences against the enemy’s next attack. You’ll have a solid chunk of time to set up more defences, as you’ll need to wait in real time for your next attack boulder to be prepared. You can even take longer to set more defences after the boulder is ready to go, but if you take too long, the opponent will get their roll on you first. Battles can get quite intense. More than a few times, after spending a solid chunk of time on a level, I found myself in a situation where the winner was decided by mere milliseconds. We’d both have battered down the castle door, and it was just in being a fraction of a second quicker in rolling over the lord that I was able to secure victory. The whole time I was rolling my boulder down in this decider attack, neck and neck with my opponent, I was keenly aware that a single mistake will cost me the level, because having my boulder roll off the level even once would cost me time, and if my defences weren't enough to knock my opponent's boulder out a couple of times, they’d have the edge on me. For such a jovial game, its ability to make my hands sweat is really quite impressive. In addition to an expanded single player game, complete with a world map to explore, there’s also expanded multiplayer, including 2 vs 2 matches, which can get very hectic indeed. It’s a pity that the general sense of humour around Rock of Ages 2 will lead many to dismiss it as unworthy of serious competitive play, because the balance and depth of strategy in placing those towers around makes for a surprisingly complex game. This is true of simply playing against the AI, too, which will utterly ruin you it you don’t develop a solid tactical understanding of how to design defences. It’s also worth noting on a technical level that the game’s been built in Unreal Engine 4, as opposed to whatever was used for the predecessor. You won’t necessarily notice it on an overt level, because the cut scenes are drawn very simply, and in motion the game’s far too quick to really take in what’s going on around you, but in practical terms it does mean that ACE Team has been able to substantially improve the physics and flow of the game, and subtle as that is, when you’re guiding a giant boulder down a mountain, precise and reliable physics are critical. Rock of Ages 2 might be aiming to get a laugh out of you, but underneath that it wants to challenge and reward you with a solid game, too. I love ACE Team, and I love what the team suggests about the future of South American game development as it continues to grow. Quirky and creative, and so very funny, Rock of Ages 2 is unlike many “comedy” games in that it backs the humour up with quality gameplay, very worthy of respect.